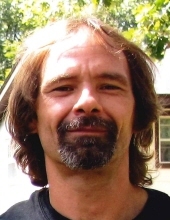 David Charles Anger, born to Kenneth C . and Alice (Elmore) Anger on April 20, 1968 in Eau Claire, WI, passed away August 17, 2018. Survivors include: daughter Laura (Nick) Leazott and son Christopher Anger; three grandchildren; his father, Kenneth; brothers: Gregory (Theresa) Butterfield, Wayde (Vicki) Anger, Terry (Jacquline) Anger, Michael (Betty) Anger, Keith,(Roxanne) Anger, Jeffrey (Wendy) Anger, Timothy (Vickie) Anger; sister Linda Proctor; and many nieces, nephews, and cousins. Dave was a kind, helpful person to all who knew him. He always had a positive outlook on life. He would build or create something to fit any need. He enjoyed the outdoors including fishing and hunting. The funeral will be held at Hope Lutheran Church, 2226 Eddy Lane in Eau Claire on August 23, 2018. There will be a viewing at 10:00 am and a service at 11:00am. Burial will be at Oak Grove Cemetery, 2857 S. Hastings Way, in Eau Claire following the service. "Email Address" would like to share the life celebration of David Charles Anger. Click on the "link" to go to share a favorite memory or leave a condolence message for the family.